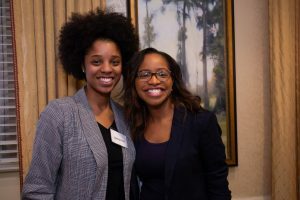 A huge and heartfelt thanks to all our sponsors, supporters and friends who came out in force on October 30th for our 5th annual STAND UP for STANDING FIRM Awards Luncheon. 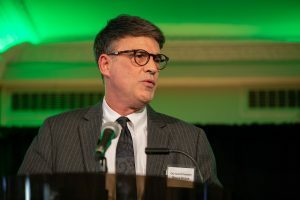 The luncheon, a sell out for the second year in a row, was held in the beautiful grand ballroom of the Omni William Penn Hotel in downtown Pittsburgh. This year’s event was particularly poignant in the immediate aftermath of the tragic Tree of Life shooting of the previous week. Our thoughts and those of the attendees were certainly with the wider Pittsburgh community throughout the event. Accepting his year’s Employer of the Year Award was President and CEO, Leroy Ball of KOPPERS. Koppers was recognized for the significant action steps made by the company this year to address partner violence in the workplace. Our 2018 Champion awardees Susan Nitzberg and Barb Penner (in memorium), were honored with gratitude for their many years of service and tireless devotion to STANDING FIRM. 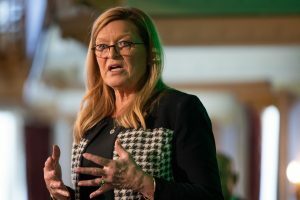 Keynote Speaker, Janine Latus, author of If I am missing or Dead, a sister’s story of love, murder and liberation, whose own sister lost her life to partner violence, shared her powerful and inspirational story with the room highlighting the critical importance of addressing partner violence in the workplace. We wish to offer a special thank you to our naming sponsors, UPMC Health Plan & Magee Women’s Hospital, without whom this event would not be possible. To all our sponsors, donors and friends – we deeply appreciate and value your continued support, and we look forward to continuing our work with you over the coming months and years. 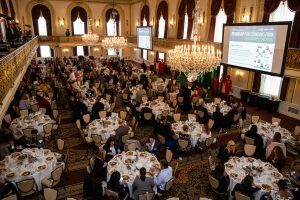 The 2017 Awards Luncheon took place on November 1st in the Grand Ballroom of the Omni William Penn Hotel. Over 300 attendees from local nonprofits, corporations, and government organizations filled the room. The keynote speaker, Susan Still, was riveting and energized the audience. 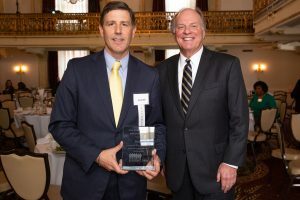 The 2017 Employer Award was presented to FedEx Ground, and President of Pittsburgh City Council Bruce Kraus received the 2017 Champion Award. Richard Citrin, President, Citrin Consulting, received the STANDING FIRM Champion Award, presented by Kristy Trautmann, 2015 Awardee. 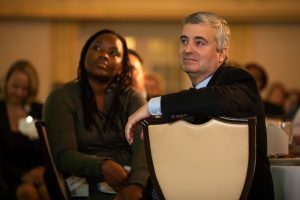 Richard has been a strong advocate of STANDING FIRM since its inception, and has served as the Chair of its Advisory Board. He has guided the initiative through many strategic decisions and advocated for it with his many contacts in the business community. The Pittsburgh Pirates set an example as a professional sports team to bring attention to partner violence as a workplace issue. 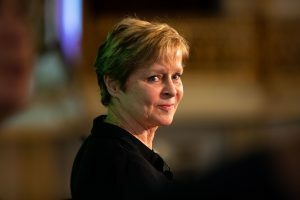 With a firm policy adopted by the team, the Pirates brought STANDING FIRM in to provide both management and staff trainings on dealing with partner violence. All players had been trained as well during spring training camp. President Frank Coonelly has spoken publicly numerous time about the impacts of partner violence on the workplace. The were the first professional sports team in Southwestern PA to stand firm against partner violence. Kristy Trautmann, Executive Director of the FISA Foundation, received the STANDING FIRM Champion Award from Lynette Lederman, Executive Assistant to Councilman Corey O’Connor. 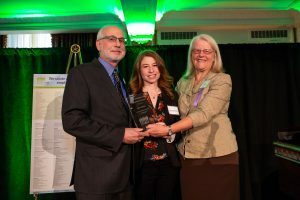 The Champion Award recognized Kristy’s tireless advocacy for STANDING FIRM and its goal to help employers address partner violence and promote safety and well being in the workplace. The creation and enduring work of STANDING FIRM would not be possible without Kristy, who continues to support our organization by applying her nonprofit leadership expertise to our management, strategic planning, and goal setting initiatives. Kristy enthusiastically brings STANDING FIRM to the table when discussing partner violence with other organizations, and has positively impacted our work and our mission. 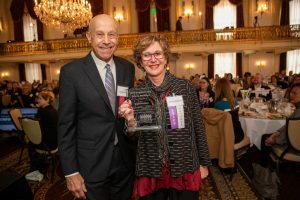 Lynette Lederman received the STANDING FIRM Champion award from Bruce Kraus, Pittsburgh City Council President. 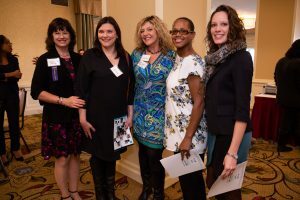 The Champion award recognizes an individual who has gone above and beyond in advocating for STANDING FIRM in its mission to engage employers in integrating business practices which address partner violence. Lynette has worked tirelessly advocating for STANDING FIRM and engaging employers in Pittsburgh and the broader community. Fred Massey, CEO of Familylinks, accepted the STANDING FIRM Employer Award from Dan Adley of KTA-Tator, 2013 Awardee. Familylinks received the award which recognizes superior integration of business practices addressing partner violence that promote the safety of the workplace and the well-being of the workforce. Employers of the Year awardees from the Department of Personnel and Civil Service Commission, City of Pittsburgh were Tamiko Stanley and Paula Kellerman, and Daniel Adley and Wendy Dameron from KTA-Tator, Inc.